The Benoni defense is a closed chess opening and belongs to the family of indian openings and is sometimes called Benoni-Indian Defense. White plays d5 to gain space in the center. If Black plays c5 right away like 1.d4 c5 2.d5 then this is the Old-Ben-Oni Defense, which has the same pawn structure, just the knight move is delayed. White does not capture the pawn on c5 because Black would regain it later by playing 2...e6 or 2...Qa5+. If Black plays the modern Benoni 1.d4 Nf6 2.c4 c5 3.d5 and then 3...b5 now, which is a pawn sacrifice, we are entering the realms of the Benko Gambit, where Black seizes the initiative on the queenside. This opening is recommended if you are an attacking player. If Black continues quietly with 3...d6, 3...e6 or 3...g6 then this leads to the Benoni main lines. Schmid Benoni The german chess grandmaster Lothar Schmid practiced in the 60th the setup 1.d4 c5 2.d5 d6 3.e4 Nf6 4.Nc3 g6 which is called Schmid Benoni now. Czech Benoni Another setup leads to the Czech Benoni: 1.d4 Nf6 2.c4 c5 3.d5 e5 - Black has played e5 and locked up the center. Future play will be expected on the wings. In the modern Benoni White has space advantage in the center but Black gains active piece play. White plays for the center break e5 and Black tries to expand with ...b5 on the queenside and blocks white's e5 center-break in putting up pressure against the e4 pawn with Re8 and exercising control of e5 using his knights to make the e5 break of White impossible. Black has a very active bishop on g7. 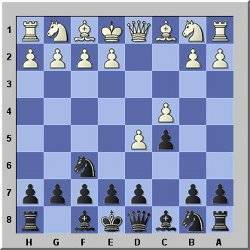 It is not blocked by a black pawn on e5 like in the kings-indian defense. As the position in the Modern Benoni is asymmetrical, it is the right setup for chess players who play an agressive game and play for a win. Players who like a quiet positional game should avoid this opening. This can be done by playing 3.Nf3 which leads to a quieter positional game. Tip: If you play White, then play the Taimanov variation, which is pretty hard to handle for Black. Taimanov Variation: 1.d4 Nf6 2.c4 c5 3.d5 e6 4.Nc3 exd5 5.cxd5 d6 6.e4 g6 7.f4 Bg7 8 Bb5+ Nbd7? (correct move is 8...Nfd7) 9.e5! If you have Black and want to play the Benoni Defense, then avoid the Taimanov Variation by varying the move sequence. Play 1.d4 Nf6 2.c4 e6 (not 2...c5) 3.Nf3 c5 because white has a knight on f3 now and cannot move the f-pawn. This makes the center break 9.e5 later on impossible. If White plays 3.Nc3 (not 3.Nf3) instead you play 3...Bb4, which is the Nimzo-Indian Defense.